Snowy mountains sparkle in the sun on a clear day in Santa Clara Valley. Once again, Skyline Boulevard has been closed due to a road washout caused by rain, 1.5 miles south of Page Mill Road. It doesn’t look serious, so the road should be open soon. Old La Honda Road (west) is also closed due to a washout. I decided to check out the snow that got deposited on the foothills behind where I live. 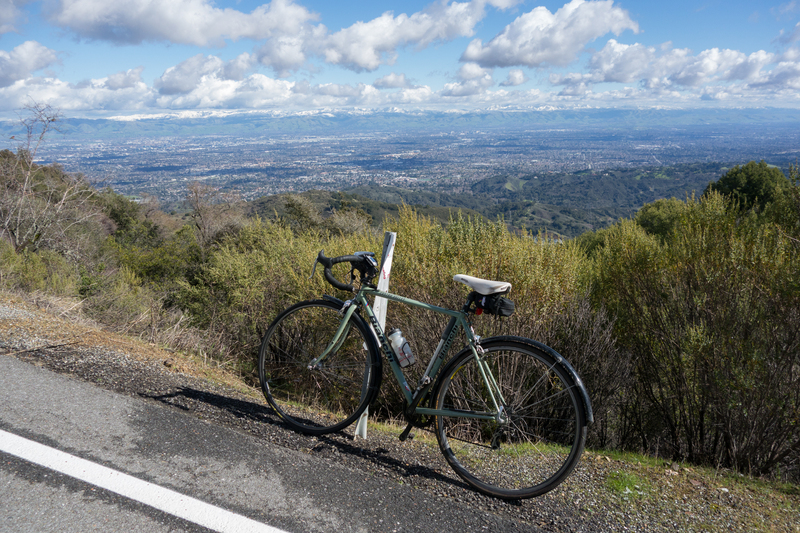 I rode up Montebello Road and got a first-hand view of nature’s wondrous ways. While I’m no fan of heavy snow, a light dusting in the hills once in a while is welcome. Montebello Road holds up well in heavy rains. I didn’t see anything of concern. I need to check my inclinometer, but it seems like the road has gotten way steeper over the past 40 years of riding on it. I guess it’s one of those geological phenomenons we’ll never fully understand. This isn’t as heavy a snowfall as we had in February 2011. I rode to Skyline to check that one out, south of Hwy 9. I didn’t post it here, mainly because I didn’t want to encourage people going up there. It was a zoo, and none too safe for riding. 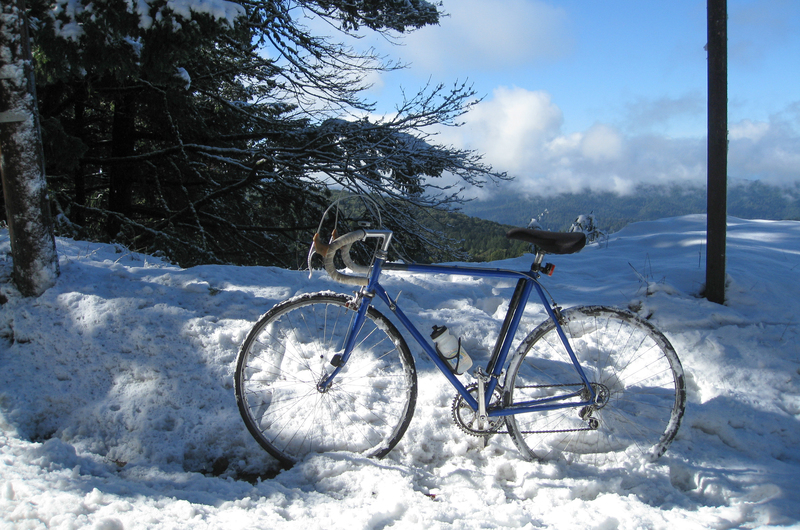 Heavy snow covered the hills along Skyline Boulevard back in February 2011. This entry was posted on February 5, 2019 at 3:20 pm and is filed under Ride reports. You can follow any responses to this entry through the RSS 2.0 feed. You can leave a response, or trackback from your own site. Montebello Rd developed some serious cracks with the rains in 2016/17. A few portions were one way for a while. They did a nice job repairing though and now it is nice and smooth. The first third of the ride has a 15% grade and some 10-12% grades. After the school the grade levels out with a few remaining 10%ers and then a 15% on the last climb on the trail to Black. Did you go over the top to Page Mill (full Monte)? Open Space recently did a nice job with the trail near the top of Black Mountain. For the longest time it was either soft with gravel or very rutted out making ascent on road bikes very sketchy. They put a hard pack trail finish on it and now it is wide and smooth, The descent to Page mill is still soft gravel, but very doable on a road bike. The trail from the gate to Page Mill is one of the best rides in the area, IMO. I went to the end of the pavement. I rode over last spring on a mtn bike, before they made the improvements you mention. I’ve ridden over to Page Mill Road dozens of times on a road bike. When I started riding there around 1979-80 the road had no annoying gravel to speak of. I’m trying to find out the history of Montebello Road. Looks like it has been in existence since at least the 1920s, based on my old National Automobile Club (N.A.C.) map. Stevens Canyon Road as well. I’m wondering if Stevens Canyon Road (now Canyon Trail) where it’s single track today (lower down) was as one time a wagon road, but the 1906 quake caused a huge landslide. We may never know. From these you might be able to find more. Note: Stevens Canyon Rd/trail was most likely only an access road for local landowners. When I first started riding up there, 2002, I noted several heavy steel gates, most bent like they had been forced open. Most if not all have been removed. Most likely local landowners trying to limit access to the jeep trail riders of the 50’s, 60’s, and 70s. Charcoal Rd used to connect through Table Mountain to Stevens Canyon Rd. Charcoal Rd. was a connector to Ward Truck Trail which traverses Portola State Park and Long Ridge Open Space to connect to Old Haul Rd. I rode Montebello today over Black Mountain to Page Mill. From Page Mill I took 35 south back to 9. Highway 35 remains fully closed between Page Mill and 9. So there is no traffic on it. The big sign says “Road Closed” but I took a chance on getting through. The washout took out a big chunk of the full roadway. It looks like it will be closed for a few more months. There is a guard in front of the washout area and no one gets through. For bikes, fortunately, the washout area is in front of the Christmas Tree Farm, so there is a convenient trail that you can take around the washout. The trail is smooth enough that most road bikes can navigate without issue. There is an open gate to the trail on both ends with a sign saying bikes and pedestrians OK. This is the best time in our lifetimes to now ride a very quiet Highway 35 between 9 and Page Mill. There is no through traffic, just locals and the few construction trucks. Hope everyone gets a chance to enjoy this road while it is closed to through traffic. Skyline is open again, single lane with control lights. I rode Skyline from Page Mill to 9 Thursday afternoon hoping to get another great ride in on a quiet closed road. Unfortunately the road is now open. The traffic level is back to normal and the single lane section doesn’t really slow traffic, just bunches it up a bit. The commute traffic is 90% pickup trucks and they go fast and don’t give you much space. I’ll have to go back to riding Skyline from Black to 9 – traffic is minimal on this segment on weekdays, quieter than weekends given minimal Castle Rock park traffic.